As the film of The Voyage of the Dawn Treader is about to grace our screens perhaps it’s good to point out the science-faith questions raised by this, the fifth book in C.S. Lewis’s Narnia series. Eustace spends much of his time at sea looking at only the scientific explanation for events, and I’m sure a slightly more thorough study of the book would be interesting from a science-faith point of view. But this quote has been burning a hole in my pocket since I heard it mentioned on a BBC programme about ‘The Narnia Code‘ in 2009. 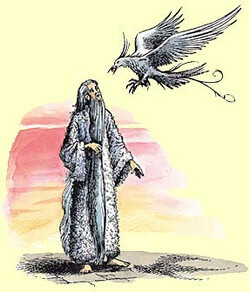 Here, Eustace is reminded of a great truth by Ramandu, the keeper of Aslan’s Table at the world’s end. CS Lewis, The Voyage of the Dawn treader, 1955. Last Friday the play Mr Darwin’s Tree was performed in Cambridge (one of two performances sponsored by the Faraday Institute as part of Cambridge University‘s Festival of Ideas). It’s a one-man show written by Murray Watts and performed by Andrew Harrison, and was commissioned by the think-tank Theos, as part of their ‘Rescuing Darwin‘ Project in 2009. It lasts 70 minutes, and I was a bit worried that – it being Friday night – I would be likely to fall asleep. But Andrew Harrison was superb as Darwin (at various ages), Darwin’s father, Darwin’s wife Emma, his Daughter Alice, the captain of the Beagle, and a number of other characters. The young Darwin’s list of pro’s and cons of getting married is hilarious!